Load testing reveals bugs and performance problems in IT systems that occur when the systems are under a load. To create a workload, Performance Lab engineers use special tools such as LoadRunner and JMeter, which emulate the simultaneous actions of hundreds and thousands of users. Today’s IT systems are so critical that any delays or failures may cause financial damage and the loss of customers. To be confident about the performance, stability, and fault tolerance of your IT systems, take advantage of our load testing services. Since 2008 we have completed hundreds of load testing projects. In this time we have both perfected our technique and accumulated substantial industry expertise. We understand well the kinds of problems that IT managers right up against in banks, retail chains, telecoms, and state agencies. Our technology supports testing not only systems using well-known protocols but also systems with proprietary protocols, systems with asynchronous calls, systems with complex and encrypted protocols, enterprise service buses, and web services. 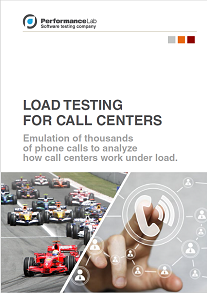 Our comprehensive load testing framework includes a number of Performance Lab’s own solutions, e.g. a SOAP/REST-based ISO-8583 processing emulator, SOAP-based loan broker emulator, SAP PI/PO/XI emulator, WebSphere log parser, MS SQL database anonymizer, test data generator for Visa and MasterCard clearing. Performance Lab’s customers always receive effective recommendations on how to solve the performance problems discovered during load testing. We use advanced APM solutions from our partners to locate problems.